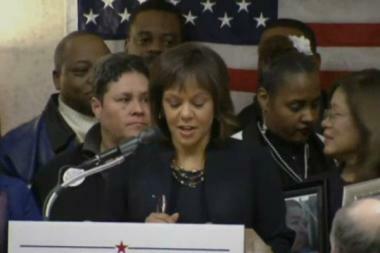 CHICAGO — Robin Kelly rolled to victory Tuesday in the race to replace Jesse Jackson Jr. in Congress. As of 9:30 p.m. Tuesday in the Democratic primary, the Matteson former state representative had 30,107 votes, or about half the total. Debbie Halvorson, a one-term former member of Congress from Crete, had 14,322 votes. Chicago Ald. Anthony Beale (9th) had 6,296 votes. In suburban Cook County, where most of the registered voters reside in the 2nd Congressional District, 253 of 263 precincts had reported. Chicago reported 166 of 170 in as well. All votes were in from Will and Kankakee counties. In her victory speech, Kelly credited her stance on gun control, telling her supporters, "You sent a message that was heard around our state and across the nation, a message that tells the NRA that their days of holding our country hostage are coming to an end. And their days of scaring Congress into submission on gun control are coming to a close." Kelly, who becomes the overwhelming favorite in the April 9 special election in the heavily Democratic district, also said she'd fight for jobs, education and immigration reform. Halvorson conceded at 8 p.m., saying, "This is a great night for Robin. She did a great job." Halvorson also called for party unity. "We are all Democrats," Halvorson said at an election-night event in Homewood. "We are all with Robin." Yet, pressed to discuss the involvement of the Independence USA Super Political Action Committee financed by New York City Mayor Michael Bloomberg, Halvorson cited the $2.3 million she said he spent in the race with attack ads against her for her favorable rating from the National Rifle Association and in favor of Kelly. "That's the way it is," Halvorson said. "I can't help it." "I will reach out to her and offer my support because in the end I am more interested in seeing the people of the 2nd District have representation in Washington, D.C., by someone who can deliver," Beale said. Voters from Hyde Park to Kankakee scrambled to the polls in the snow Tuesday as top contenders fought to get out the vote in a special primary to replace Jackson Jr. in Congress. "Mother Nature isn't on anybody's side today," said Sean Howard, spokesman for Halvorson. Yet Howard and Jon Blair, Kelly's campaign manager, both expressed confidence late in the day in the 2nd Congressional District race. "We're not seeing the weather affect our predicted turnout at all," Blair said. "Of course, we didn't expect the vote to be terribly high to begin with." Howard was pleased by relatively high early turnout in Will County, which he termed a "Republican stronghold" where voters appeared to be crossing over to vote Democratic — most likely to Halvorson's benefit. Halvorson indeed won both Will and Kankakee counties. But, with most of the votes in the city and suburbs, it wasn't enough. Beale boasted he had the ground game in relatively compact Chicago, and even started talking Tuesday of his possible replacement in the City Council, but Howard claimed turnout was "dangerously low" in the city. Beale blamed his loss on the low turnout. "Certainly if we could have gotten more people to the polls that would have made a difference," he said. "Bad weather and years of frustration by voters kept them from voting." There were also five candidates on the ballot in the Republican primary, but the winner is given little chance in the heavily Democratic district in the general election. As of 9:30 p.m., Paul McKinley had 947 votes, Eric Wallace 924 and Lenny McAllister 851. Chicago election officials estimated turnout at 15 percent of the 120,000 registered. That was consistent with estimates in suburban Cook County and Will and Kankakee counties, with Cook having the most registered voters at 232,000. Kelly seized on gun control as the primary issue at a time when the city's murder rate was top of the news, and it carried the election. State Sen. Toi Hutchinson (D-Olympia Fields) picked up the early endorsement of Cook County President Toni Preckwinkle, but both were blindsided by the impact of Hutchinson's favorable rating from the NRA, which proved to be the eventual weak point of Halvorson as well. Hutchinson eventually dropped out, throwing her support to Kelly. 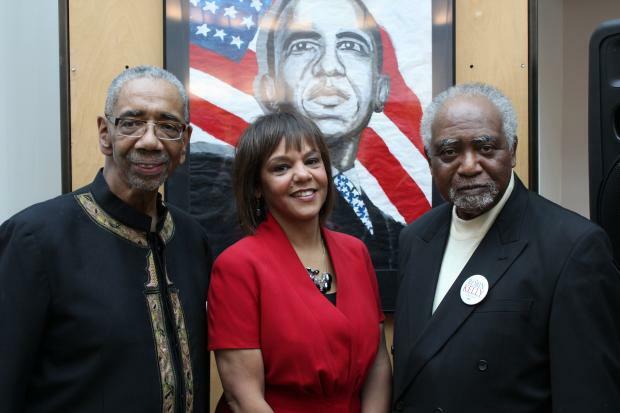 Kelly also picked up the endorsements of top Chicago-area African-American and progressive members of Congress, including Danny Davis, Bobby Rush, Jan Schakowsky and Mike Quigley. Guns chased state Sen. Donne Trotter (D-Chicago) from the race before he could even formally file his petitions. He, too, came to support Kelly. Halvorson, meanwhile, didn't shy away from her opposition to a ban on assault weapons, although she tempered her support for the NRA. She also picked up the support of the Illinois State Rifle Association in a direct-mail campaign last week. That, however, was a pop-gun compared to the $2.3 million blasted into the race by Bloomberg and his gun control-oriented Independence USA Super PAC. The group ran TV attack ads against Halvorson and in favor of Kelly that Halvorson said "compromised" the race. Bloomberg was unapologetic, saying, "I'm part of the public. I happen to have some money." Mayor Rahm Emanuel avoided making an endorsement, except to say the victor had to be a part of "Team Chicago" in Congress. Beale, however, echoed charges the race was being bought, and trumpeted his own record on guns. He came up with a TV ad, but could only afford to place it on YouTube. Joyce Washington, of South Shore, got a campaign ad on TV, but still found herself on the outside looking in at the top candidates. The race was prompted by Jackson's resignation shortly after winning re-election in November. (He had beaten Halvorson in the Democratic primary a year ago.) Jackson went on to plead guilty to federal charges of misusing campaign funds alongside his wife, former Ald. Sandi Jackson (7th). She was replaced by Natashia Holmes, who was appointed by Emanuel.